I live with three long haired cats that shed in the winter, and my place gets dusty at times too. I have a fairly new cast iron skillet that I use once every one or two days. I don't have any shelves in the kitchen big enough to store it so I have to hang it. There's always cat hair and stuff stuck to it because I store it in the open. So then I have to clean it which is making seasoning difficult. How can I store this pan in a way that is both convenient and protects it from the environment? I have found covering it in foil to be somewhat effective but tedious and not perfect, and also wastes a lot of foil. Plastic is difficult because I have to let it cool, although if the oven is off I can let it cool in there. I can't really store it in the oven because I use the oven often. The design of my house makes it impossible to keep cat hair and dust out of the kitchen. I also don't understand the physics and chemistry behind how the seasoning layers develop so I'm not sure what storage techniques are bad for the condition and "development" of the pan. Is there a good way to store it that keeps it clean and in good condition? First off, cleaning isn't necessarily bad for seasoning. "Soap removes seasoning" is largely a myth; Serious Eats discusses this at length. The seasoning is actually a polymer chemically bonded to the iron, not just something coating the outside that will easily wash off, so anything that isn't able to remove the iron shouldn't remove it. Certainly a light wipe with a wet or soapy cloth is perfectly fine. If you're hanging it on the wall, hang it so the main part of the pan faces the wall. This will mean less stuff gets on it (and more gets on the bottom, which is irrelevant). If you crochet or knit, or know someone who does, make a cast iron pan cover. I know a friend who did this. You can make it out of a relatively heat-resistant yarn, so that it isn't damaged by the pan being warm. You might also be able to reuse an old sweater, as long as you confirm the fabric is something that can stand up to the heat (100% cotton is probably best since it's hard to say what different polyesters will do). While the pan cools from your seasoning, keep it in the oven, or turn it upside down. That way it can be cooler before you cover it. Buy enamelware. Maybe cast iron isn't the best idea in a long-hair cat household. Before using the pan, heat it up a lot (20 minutes or so in the oven or over high heat). Then brush off whatever is on it (carefully). This will remove the cat hair effectively without risking any damage to the seasoning. This is a bit "out there" and it won't be pretty, but it might be really functional. 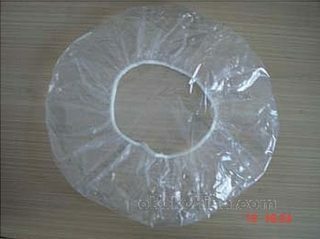 How about one of those throw away shower caps, like hotels sometimes give away? How about a plastic or paper bag once it is completely cool. I keep mine in the oven. Works like a charm. My family has always had cats and always used cast iron skillets. We "dry" them by placing on a low flame stove burner and store them in the oven...gas oven that is. Not the answer you're looking for? Browse other questions tagged equipment cast-iron storage or ask your own question. How do you clean and season a cast iron pot? How to salvage a totally nuked cast iron dutch oven? How did rust appear on my cast iron in a matter of minutes? Is not using soap when washing cast iron pans safe? How do I fix improperly seasoned cast iron pans?